Sequencing.com is the world's largest online marketplace for DNA-powered apps and personalized products. Our users love apps that transform their genetic data into meaningful and actionable information. If you've developed an app that is powered by genetic data, the App Market API allows you to tap into our incredibly large number of users by selling your app in Sequencing.com's App Market. 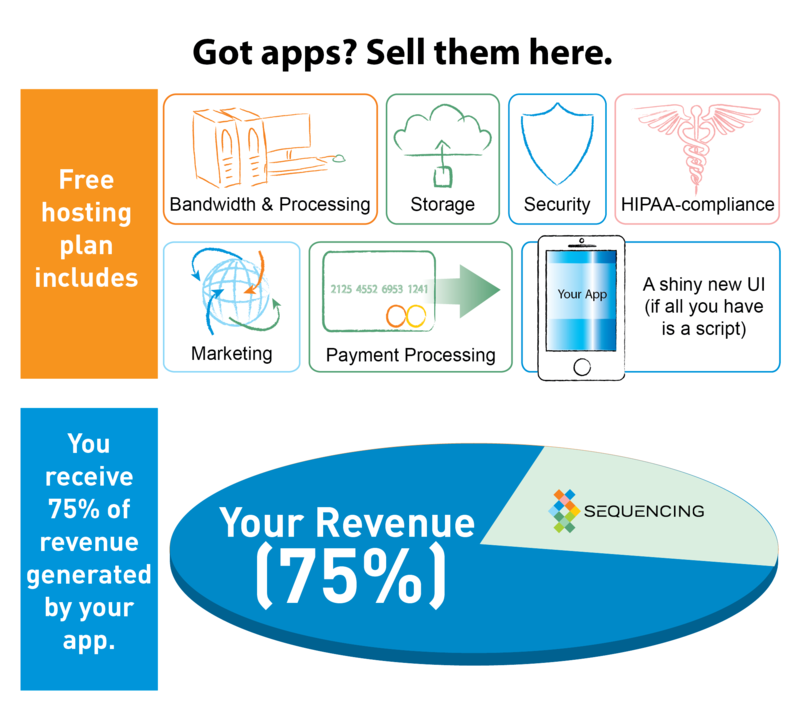 When you add your app to Sequencing.com's App Market, you no longer have to focus time or expense on data compatibility, data storage, data security, marketing, user acquisition and payment processing. We'll handle all of this for you so you can focus on developing awesome apps. The App Market API enables quick integration of your apps into Sequencing.com App Market. Use this API to sell your app in Sequencing.com's App Market while continuing to host your app on your own site. The user’s genetic data is processed using your systems/infrastructure. The App Market API is simple and it's just about 3 calls between Sequencing.com and your system. We are developer friendly and provide you with API plugins, a secure integration environment and a convenient development console so you can test and trace while implementing the API. Your app can be available for sale in the App Market in a few days. Your app instantly becomes universally compatible with all genetic data formats. Without any coding effort on your part, your app will instantly be compatible with genetic data from almost any source including whole genome sequencing, exome sequencing, 23andMe (all versions), Ancestry.com (all versions), Family Tree DNA (all versions), National Geographic (all versions), and many other genetic testing provides. You no longer have to worry about data file compatibility. As new data formats are released, Sequencing.com will seamlessly enable new data formats to be compatible with your app. Your app obtains access to Sequencing.com’s large user base that is growing at an incredibly fast rate. 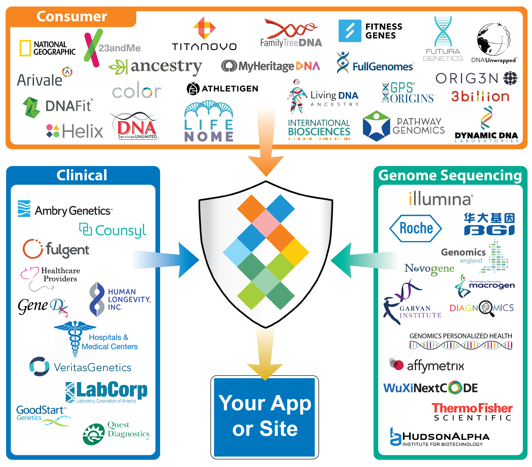 Your app becomes part of a centralized market for apps powered by genetic data. Adding your app to Sequencing.com's App Market is completely free. We don't believe in pay-to-play. There's no upfront fee and we never charge to integrate or use our App Market API. We also provide free technical support throughout the entire integration process and beyond. The App Market API is designed to be quick, easy and painless for you to integrate into your site. You can make your app available to all users to purchase or you can specify that only specific types of users can access your app. When a user purchases your app, your app will be added to the user’s My Apps page along with a ‘Start’ button. The user can then use your app at any time. When user clicks ‘Start,’ the user will be able to select a genetic data file stored in his or her Sequencing.com account. You can also have the option to have the user provide non-genetic information, such as data your app requires. This can be any non-genetic information such as the user's age, gender, BMI, height, weight, etc. the user's genetic data can also be sent to your system via JSON, which is similar to 23andMe's API. The user’s genetic data is processed using your current system. When your site is ready for the user to interact with it (such as when the results are ready), your system will send an API call to Sequencing.com letting us know that the user’s data has been successfully processed and that the results are ready for the user to view. We automatically make this information available to the user who is redirected to your site. The user interacts with your site using your software's current UI. You pay nothing (ie you have nothing to lose). You receive 75% of the sales price of your app. Payment will be sent to you every two weeks via ACH deposit, Wire, Paypal or Venmo. The Monetization Dashboard provides you with real-time sales statistics so you can easily monitor your sales and royalties. You can also view all payments sent to you from Sequencing.com and easily modify the method by which you receive your monthly payments. When your app is added to Sequencing.com's App Market, your app will also become instantly compatible with all genetic data formats generated by any genetic test. This includes whole genome sequencing data, exome data and data from all consumer genetic testing companies such as AncestryDNA, 23andMe and MyHeritage. Sequencing.com provides PCI-compliant payment processing for your app. You are able to not only set the sales price for your app but also determine the sales terms. Important consideration: A large percentage of Sequencing.com users have more than one genetic data file in their account, such as a single account that contains the genetic data for each family member. This is important to take into consideration when selecting the sales terms. User is charged the app's sales price any time the user starts the app with a genetic data file that has not been previously processed by that app. Example: If a user pays for File A and File B to be processed by your app, the user will be charged your app's sales price for both File A and File B. If in the future the user starts your app with File A again, the user will not be charged for this app job because File A was already processed by that specific app. User is charged the app's sales price each time the user starts the app. Example: If a user pays for File A to be processed by your app, the user will be charged your app's sales price for File A. If in the future the user starts your app with File A again, the user will be charged again. Unlimited: User is charged a single upfront price for your app and can then use the app an unlimited number of times. The app never expires. Limited Time Only: User is charged a single upfront price for your app and can then user the app an unlimited number of times within a specific length of time. You determine the time period, which can be any length of time. The most popular is three months. After the time period, the app will expire from the user's account and the user will have to re-purchase your app. Limited Use Only: User is charged a single upfront price for your app and can then use the app up to a maximum amount without time limitation. You determine the amount of usage. After the app is used the maximum amount, the app will expire from the user's account and the user will have to re-purchase your app. Limited Time & Use (Mixed): User is charged a single upfront price for your app and can then use the app up to a maximum amount with a time limitation. You determine both the time period and the amount of usage. After the app is used the maximum amount OR if the time period is reached, the app will expire from the user's account and the user will have to re-purchase your app. The Special Terms below can be added to any of the Pricing Terms above. These Special Terms enable you to provide an incentive for the user to experience your app. User is charged an introductory price for a limited amount of time or uses. Once the time or usage threshold is reached, the user is thereafter charged your app's standard sales price. You determine the introductory price as well as the time period and/or the maximum number of usage allowed. Example: A user purchases your app and is charged $10 for the first use. After the first use, the user is then charged $20 thereafter whenever that app is used. User can use your app for free during a limited amount of time or uses. Once the time or usage threshold is reached, the user is thereafter charged your app's standard sales price. Example: A user purchases your app and can use the app once for free. After the first use, the user is then charged $20 thereafter whenever that app is used. When you submit an app to the Sequencing App Store you’ll also be able to designate one or more results from your app as App Chains. This means that other developers can then use the output from your app when they use the Real-Time Personalization® (+RTP) API. Each time your App Chain is used during an API call by an app powered by the +RTP API, you will receive a royalty payment. 1) Read the App Market API documentation below. 3) Once you become a Registered Developer, you'll receive access to Sequencing.com's private integration environment called JEDI. 4) Use the Development Console at JEDI to test your endpoints. 5) Once your endpoints are working, we'll add your apps to JEDI's private App Market. This will allow you to test the entire workflow end-to-end in an actual (but private) App Market. 6) Only after you approve your apps in the JEDI App Market will we deploy your apps to the publically accessible App Market at Sequencing.com (ie our production site). *Please note that you cannot access JEDI, use JEDI's Development Console or proceed forward with implementing the App Market API until you contact Support. Our Support Team will send you additional resources for using the App Market API as well as Sequencing.com's Registered Developer Agreement. Becoming a Registered Developer allows you to access JEDI and proceed forward with adding your apps to Sequencing.com's App Market by implementing the App Market API. It's simple, quick and free to become a Registered Developer. Becoming a Registered Developer is also a necessary first step towards adding your app to Sequencing.com's App Market. To get started, please submit a Support Request and let us know you are interested in becoming a Registered Developer. We'll then guide you through the simple registration process. Sequencing.com's provides registered developers with access to a dedicated, secure integration environment called JEDI. JEDI includes a Development Console, which enables you to test your integration of the App Market API. Using JEDI, you'll also be able to view your app and perform end-to-end testing of your app(s) in a private App Market that is not accessible by the public. Once the integration is complete and you approve your app appearance in the App Market, your app will be ready for launch in Sequencing.com's production App Market. The Development Console allows you to test and verify your integration of the App Market API. Includes sending demo genetic data to your system in either VCF or 23andMe txt format. Although it doesn't yet appear as an option in the Development Console, we also have 23andMe JSON format available as a demo format. Just let us know if you want to use the console with this format and we'll make it so. Sequencing.com Universal Genetic Data Compatibility technology is provided for free to all apps available in our App Market. This makes your system fully compatible with almost all genetic tests and genetic data formats, including whole genome sequencing, without requiring you to perform any additional development effort now or in the future. This unique technology also includes the ability to send genetic data to your system in any format. At the beginning of the integration process, you simply let us know the genetic data format your system is already optimized for. Regardless of the user's actual genetic data format, Sequencing.com will provide your system with the user's genetic data in the format your system is already optimized for. For example, if your app is already optimized for processing genetic data in AncestryDNA format, simply let us know that your app works best with this format. The user can then select any file format when starting your app at Sequencing.com, such as FASTQ, FASTA, BAM, SAM, VCF, 23andMe, Genes for Good, etc., and Sequencing.com will send the genetic data to your system in AncestryDNA format. NOTE: A demo Sequencing.com Authentication Token is required to use the JEDI Development Console. Please contact Support to obtain this demo token. Use the Development Console's Job Submission Test to receive demo genetic data via the App Market API. The App Market API is designed to require only minimal changes, if any, to your system. Sequencing.com provides API plugins including bootstrap code, a secure Integration environment for testing your app's integration before production deployment, straight-forward documentation, and 24/7 support. Our goal: ensure that adding your app to Sequencing.com's App Market is quick and easy. Just let us know if you would like the API plugin translated into a different coding language or if we can help in any way. You implement the App Market API and your app is added to Sequencing.com's App Market. You provide your app's assets (company logo, app icon, app description, visuals such as images or videos, etc.) to Sequencing.com and specify your app's sales price and terms of sale. Once the App Market API has been implemented, a user can view and purchase your app in Sequencing.com’s App Market. After purchasing your app, the user can use your app at any time simply by signing into his or her Sequencing.com account. When the user starts your app, the user selects a genetic data file stored in his or her Sequencing.com account. Sequencing.com provides your app with Universal Compatibility with all genetic data formats from all genetic testing technologies. This includes everything from whole genome sequencing data to consumer genetic testing services such as AncestryDNA and 23andMe. In addition to genetic data, the user can also provide non-genetic information such as the user’s age, gender, BMI, height, weight, etc. You determine what non-genetic information, if any, is necessary for the user to provide so that your app(s) processes successfully. Sequencing.com will ask the user to provide this information when the user starts your app and will then securely transmit this information to your system using the App Market API. Using the API call above, Sequencing.com sends your system the user’s genetic data (along with any non-genetic information your app needs) and your app processes the data. Processing of the data is performed using your system's current workflow. You determine the file format of the genetic data that Sequencing.com will make available to your system. Regardless of the format of the data stored in the user's Sequencing.com account, our Universal Genetic Data Compatibility technology will provide genetic data to your system in any format that is compatible with your system. Adding your app to Sequencing.com's App Market makes your app instantly compatible with all genetic data formats. Example 1: User has whole genome sequencing data as paired FASTQ files but your system is only configured to process 23andMe v4 data. Our Universal Genetic Data Compatibility technology instantaneously makes the user's data available to your system in 23andMe v4 format. You can even choose to receive the genetic data as a 23andMe-compatible CSV file or via 23andMe-compatible JSON streaming. Example 2: User has AncestryDNA data but your system is only configured to process VCF files. When this user uses your app, the user's genetic data is made instantly available to your system in VCF format. Sequencing.com notifies the user that the app results are ready and provides guidance for accessing the results. The user views the app results either at your site or at Sequencing.com or both. It's your choice. User accesses the app results at your site. This is usually accomplished by providing the user with a url that includes a token. We can also provide the user with a url to your site and a username and temporary password (both generated by your system and provided to the user when Sequencing.com notifies him or her that the app results are ready). For optimal UX, the API also allows your system to send the app results to Sequencing.com as a pdf, html file(s) or image file(s). These files are then securely stored in the user's Sequencing.com account for free and forever (ie they never expire). The the user will then be able to access, share, download or delete the results at any time. Sequencing.com provides 3rd party side implementation of the following endpoints. Check our GitHub repository for available implementation. Use the Development Console to test your endpoints and conduct testing integration. All HTTP endpoints described in this section should be located on your side and invoked by Sequencing.com servers. 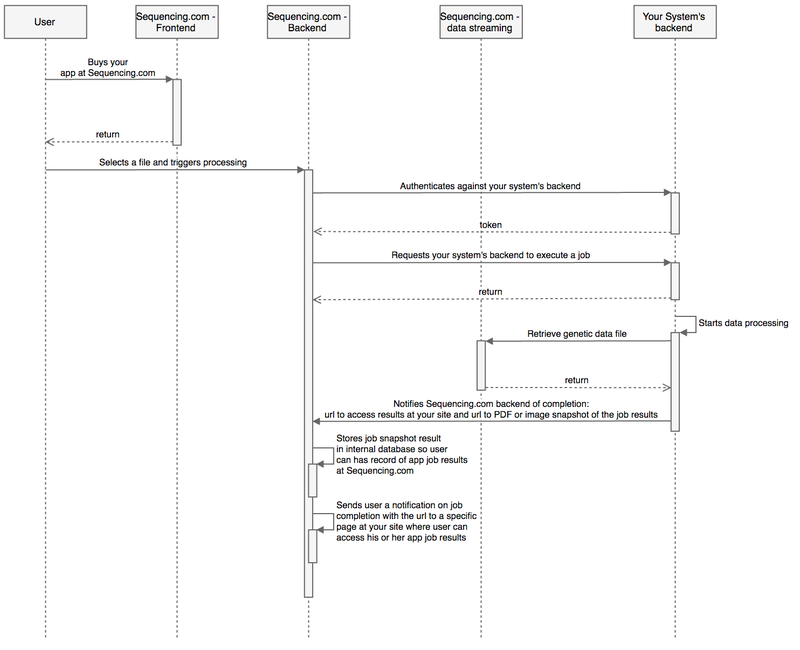 All requests that are sent to endpoints by Sequencing.com servers contain following HTTP headers. This header allows your system to identify Sequencing.com's source environment that triggered the request to your system. This is helpful if you only have a single environment on your end. Please contact Support to obtain a demo token to use with the JEDI Development Console. User identifier so your system can identify a specific user; enables your system to identify if the same user makes multiple purchases of your apps. Purpose: Provides your system with data needed for processing. ID of file to retrieve from data access host. This file contains the user's genetic dataset that will be processed by your app. There will be one dataFileId for each of the user's files. This ID will remain constant except if the dataset sent to your system for the file must be regenerated. For example, if your app is originally receiving data on 100 variants from Sequencing.com but then at a later date you increase this to include 50 additional variants (so the dataset Sequencing.com will send your system is now 150 variants), if a new sequencingJobId is started by that same user (same userId) for the same file (same masterFileId), the dataset from that file will be regenerated so that the dataset sent to your system now consists of 150 variants. When the dataset from the user's file is regenerated, the dataFileId will change. If the dataFileId for a new sequencingJobId is different than the dataFileId in the previous job but masterFileId is the same: this means the previous dataset generated from that user's file has expired and your system should obtain the new (current) dataset for that masterFileId. ID of the user's file at Sequencing.com. This ID is provided for identification purposes only; it is not used to retrieve anything from data access host. There will be one masterFileId for each of the user's files. This ID will always remain constant even if dataFileId is regenerated. This endpoint enables your system to identify whether data is from the same file or a different file in the user's Sequencing.com account. This is important because many users have more than one genetic data file stored in their Sequencing.com account. While userId can be used to define a 'user account' on your system, masterFileId can be used to define a 'profile' in a user account. This will enable your system to be able to create one or more profiles for each user account because if the user starts two or more app jobs using your app(s), your system will be able to identify the app jobs were started by the same user (same userId) and that the app jobs are either using data from the same file in the user's Sequencing.com account (same masterFileId) or are using data from a different file in the user's Sequencing.com account (different masterFileId). userId can be used to define a 'user account' on your system. Additional job specific attributes, such as the user's age, weight, etc., that are sent from Sequencing.com to your system. While the user will be able to enter weight and height in either Metric or Imperial units, all data will be converted to Metric and provided to your system as Metric (weight in kg and height in cm). Value of this header must contain “Bearer ” concatenated with the token that was sent to Sequencing.com in a reply to authentication request as per Section 1.1.1. This is required to authorize Sequencing.com to access your endpoint. Note: The dataFileId, masterFileId and userId used below are for example purposes only. They are not active and will not work. Please contact Support to become a Registered Developer. You will then receive active data for these fields to use during your development and integration. where <authenticationToken> should present token to access your system's endpoint. Is called from Sequencing.com side for all job results retrieval. The same as request specification in Section 1.1.1. All Sequencing.com endpoints expect apiKey URL query parameter to be passed. Its value is acquired from the call to 1.1.1 endpoint. When implementing the App Market API, you'll indicate to Sequencing.com's Onboarding Team what genetic data format is most optimal for your system to process. We'll then configure the App Market API so that whenever a user purchases your app, the user's data will always be provided in the data format your system is already optimized for. 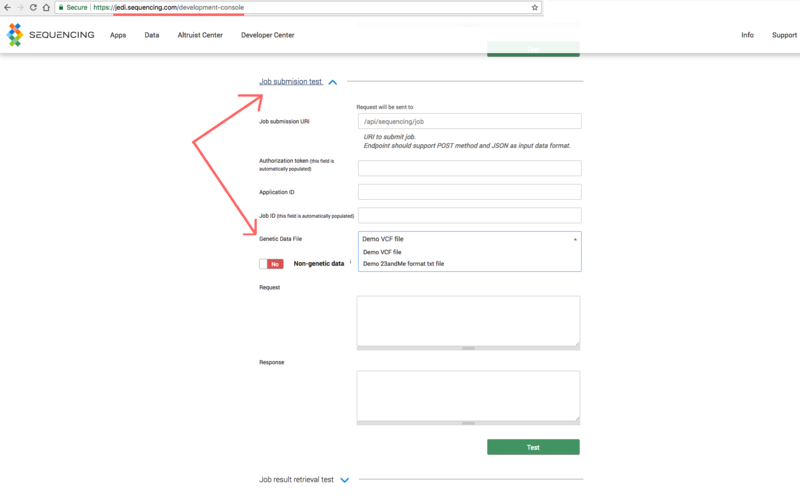 You can select to receive a user's genetic data in almost any format including gVCF, VCF, Clinical+ VCF, 23andMe data file, 23andMe JSON API, Ancestry.com data file, BAM, FASTQ, etc. Example: Your system is already configured to process 23andMe v4 data files. You'll indicate this to the Sequencing.com Onboarding Team so that whenever your apps are used, Sequencing.com will send the user's data to your system in 23andMe v4 format. Even if the user has selected a FASTQ or BAM file as the input file for your app, Sequencing.com will instantly send you the data in 23andMe v4 format. Sequencing.com's Universal Genetic Data Compatibility enables your app to instantly become compatible with all genetic data formats. This allows you to focus on creating the best possible apps while Sequencing.com handles the complexities and ensuring your app is always compatible with all data formats. This required endpoint provides your system with the ability to securely obtain the user's genetic data. 3 file int no 1 If specified together with "json" parameter, data will be provided as a downloadable content via "Content-disposition: attachment"
Note: The id and Authorization Token used below are for example purposes only. They are not active and will not work. Please contact Support to become a Registered Developer and obtain an active Authorization Token. where <sequencingAuthenticationToken> should present a token to access the endpoint on Sequencing.com that is acquired during authentication without brackets (refer to Section 1.1.1 for more details). This required endpoint provides your system with the ability to securely provide app job results. This endpoint should be secured and accessed by using the token sent to your system in a request described in Section 1.1.1. Depending on how your server side works, Sequencing.com offers three options for delivering the app results to the user. You can implement one or more of the options. Optimal UX is obtained by implementing option 1 or option 2. Sequencing.com will not provide this link (outputFiles, the Downloadable Copy of Results URL) to the user and instead will only use this link to download a static copy of the app job results. The link (the Downloadable Copy of Results URL) should allow Sequencing.com's system to access a downloadable file at your site, such as a graphical representation of the app results for that user. Acceptable formats include: PDF, file containing HTML, image (png, jpg), etc. We support most formats. The link should reply with application/octet-stream MIME type. Sequencing.com will download this file from your system and will securely store it in the user’s Sequencing.com account. The user will be able to view the app results simply by accessing his or her Sequencing.com account. Storing the app results in a user's account is free for both your system and the user. App results are secure and confidential. They are stored forever in the user's account (ie they never expire and are not deleted). The user can share, download and delete the app results at any time. Having a copy of the app results from your system saved in the user’s account will allow the user to view the app job results at Sequencing.com. If option 3 is implemented along with this option then the app results at Sequencing.com will also include the Callback URL. The PDF report will be securely stored in the user’s Sequencing.com account. The user will be able to access the PDF report by logging into her or his Sequencing.com account. App results are secure and confidential. They are stored forever in the user's account (ie they never expire). Storing app results in a user's account is free for both you and the user. Having a copy of the app results from your system saved in the user’s account will allow the user to view the app job results at Sequencing.com. This provides optimal UX. This Callback URL provides the user with direct access to your site so they always have the choice to view the app results at Sequencing.com or at your site. This URL will be conveyed to the user. Your system will use the API described here to send Sequencing.com a link (the Callback URL) to your site. The user will use this link (the Callback URL) to access his or her results at your site. Sequencing.com uses job status reporting so our system is aware of the status of the app at your system. This allows Sequencing.com to know if the app at your system has started, completed or failed due to specific reasons. This job status notification endpoint may be called several times for each app job. If 1, 2 or 3 then this means no results are available. The user will receive a notification from Sequencing.com that there was an issue with the app and to please restart the app. Sequencing.com's App Team will also be automatically notified and will investigate. Contains copy of app results. There is no limitation on content returned by this URL. This URL should be directly accessible without authentication. Contains copy of app results as base64 encoded PDF file. URL that will be provided to the user so that the user can access and view the app results at your site. Sequencing.com recommends providing a URL that includes a token to identify a specific user. This provides improved UX compared to using the username and password fields. Optional username and password that is dynamically generated by your system. The user will enter these credentials in the form based authentication at your site to access. This will allow the user to access and view the app results at your site. password string no Optional username and password that is dynamically generated by your system. The user will enter these credentials in the form based authentication at your site to access. This will allow the user to access and view the app results at your site. Your system starts processing data. Your system finishes processing with error due to inability to download the user's genetic data file from Sequencing.com. Your system encounters an unknown error during app job processing that causes the app to stop (ie the app is unable to continue processing the user's data). Your system has successfully finished processing (ie your app completes processing the user's data) and sends two base64 encoded PDF reports (without callback URL). Your system successfully finished processing and sends both base64 encoded PDF and callback URL with token. Your system has successfully finished processing and sends one downloadable PDF report using results URL (without callback URL). Your system has successfully finished processing and sends two downloadable PDF reports using two results URLs (without callback URL). where <sequencingAuthenticationToken> should present a token to access endpoint on Sequencing.com that is acquired during authentication without brackets (refer to Section 1.1.1 for more details). Your system has successfully finished processing and sends callback URL only (without providing PDF report). Your system has successfully finished processing and sends the callback URL with dynamically generated username and password. Sequencing.com will convey this Callback URL along with the username and password to the user and user will use this to login to your site to obtain access to app job results. This example applies only if a Callback URL is included while a Downloadable Copy of Results File URL is not included. Your system has successfully finished processing and sends both callback URL with token and pdf report using results URL. Your system has successfully finished processing and sends callback URL with username and password and pdf report using results URL. Got a question? Have a request? Ready to add your app to our App Market? Our goal is to ensure that adding your app to Sequencing.com's App Market is quick, easy and painless. We have several resources and tools to facilitate implementing the App Market API. If you don't see something that will be helpful, let us know and we'll implement it.